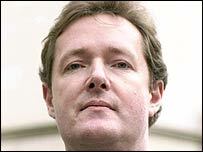 Former Daily Mirror editor Piers Morgan will not be charged after a four-year DTI probe into the "City Slickers" share dealing affair. The inquiry looked at claims Mr Morgan bought stock in Viglen, a UK-listed company, shortly before its shares were recommended on the paper's city page. The DTI confirmed to the BBC Mr Morgan will not face charges following the investigation. Mr Morgan said he always "believed my name would eventually be cleared". Mr Morgan bought £20,000 of shares in Viglen Technology the day before it was tipped on the paper's City Slickers page, but he was cleared of any wrongdoing by the Mirror's board. He later sold the Viglen shares and promised to give his profits to charity. But, in 2000, he was criticised over the incident by the Press Complaints Commission (PCC), which ruled he had breached the industry's code of conduct. "I have today been notified by the DTI that I have been completely cleared of any wrongdoing in respect of the City Slickers shares affair," Mr Morgan said in a statement. "I co-operated fully with the DTI during their painstaking four-year investigation and always believed that my name would eventually be cleared, as indeed it now has." Mr Morgan was sacked from the Daily Mirror last month over the use of faked images of abuse of Iraqi prisoners by British soldiers. The DTI has confirmed that charges will be formally brought against three people connected with the City Slickers affair, but said that no criminal proceedings would be taken against Mr Morgan. Former Mirror tipsters Anil Bhoyrul and James Hipwell and a third man, Terry Shepherd, are alleged to have used the newspaper column to create a misleading impression of the value of certain investments. Share ramping, insider dealing goes on every single day. The DTI's prosecution unit has sent information to Thames Magistrates Court alleging the three men, between 1 August 1999 and 29 February 2000, conspired to commit an offence contrary to section 47(2) of the Financial Services Act 1986. A DTI spokesman said they were alleged to have breached the law "by creating a misleading impression as to the value of investments, for the purpose of creating that impression and of thereby inducing other persons to acquire those investments, by using the City Slickers column in the Daily Mirror to tip those investments". All three men are expected to receive a summons to attend court to see if there is a case to answer. James Hipwell said: "I have no doubt I am going to come out with all guns blazing (to defend myself against the accusation). "The way this investigation has been handled has been appalling. (But) I am relieved that the end is in sight." He told the BBC's Today programme: "There's no reason why this has gone on as long as it has. This could well have cost the British taxpayer £5m. "Inevitably, some of the things we wrote about ended up being companies that we actually owned shares in. "We were trying to put the kind of information that was only available to a coterie of pin-striped professionals in business to a wider audience. It was just reporting what we heard. "I've done nothing that a multitude of other financial hacks haven't done themselves. Share ramping, insider dealing goes on every single day. "For them (the FSA and DTI) to proceed against two tabloid journalists when it's going on in the City on a massive scale every day just seems crazy." "Piers Morgan has been cleared of all charges"